A dictionary that provides a window into word history with charts a graphs. Word histories can be revealing—consider that the word "mortgage" comes from the Latin for "dead pledge." Traditional dictionaries contain etymologies, but often in a form that's abstruse and easy to ignore. 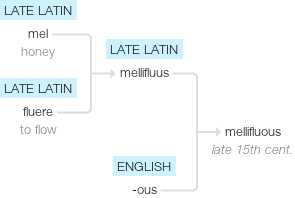 We added a set of visual elements to the Google dictionary, what you see when you type define mellifluous into the search box. The simple branching flow chart to traces back the origins of words. There's a saying that language is "fossilized poetry" and the diagrams make the fossils easy to see. Some words are surprising, but some are quite logical. Meanwhile, mustaches came into style, fell back, and now are coming back into style. If you want to play with this yourself, just go to Google and type "define" plus your favorite word.